Haven been filled by a very busy days both professionally and personally with really highs and some lows, but so its life and we need dealing with all of it. 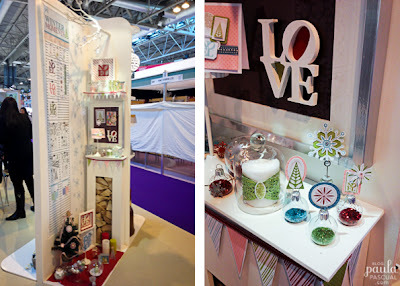 I know it took place almost three week ago, but I havent talked about my experience at Stitches - the UK craft trade show - this year. 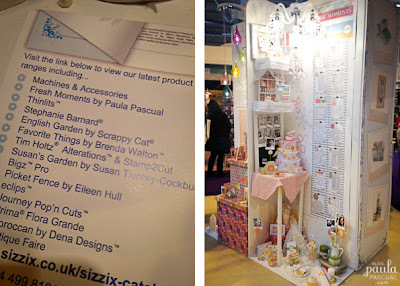 Of course, I was demonstrating at the Sizzix stand, such an honour to be demonstrating at what I think - and many others agree! - one of the best stands in the whole show for a third year running. Forgive the bad quality of the photos as they were taken with my mobile. This year, though, it was extra special. I had not one but two collections launching: Fresh Moments - Spring available right now! I had so much fun putting these areas together. Although, in true creative nature, I was very anxious about them before the show opened. But people were very kind with their positive comments! I was demonstrating the new Big Shot Starter Set - available from May. The new machine - available on its own as well as part of the new Starter kit - is so lovely. The samples on the left were mostly made by the super talented and amazing person that is Pete Hughes. 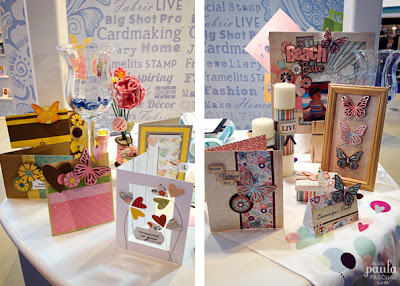 I think this new starter kit is great - but then I am biased, I designed them! 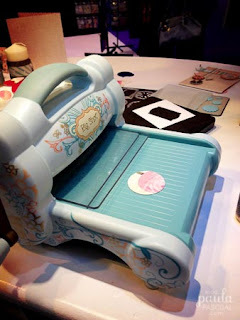 with many simple and useful shapes in all technologies or type of products that Sizzix produces. The super star that is Celine Navarro was also demonstrating and teaching the workshops for Sizzix. She is so lovely, an talented too, but that is well known already! And also Celine is the editor of EntreArtistes, a french scrapbooking magazine of the highest quality. In the pages of the latest issue I found this beautiful layout by Karine using the everyday butterflies using vellum. I love it! On the first day, before the show opens, Pete explained each area concept to the rest of the team. He and Debi did a fab job in all the areas they had work on. The flowers from the new Susan's Garden collection were extraordinary, so was once again the inside of the house. 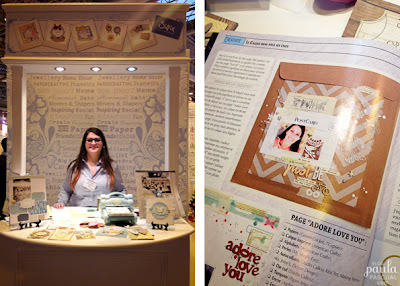 Madison Parker from Echo Park and Carta Bella papers came to visit the stand as Sizzix does a collaborative line with Echo Park stamps. 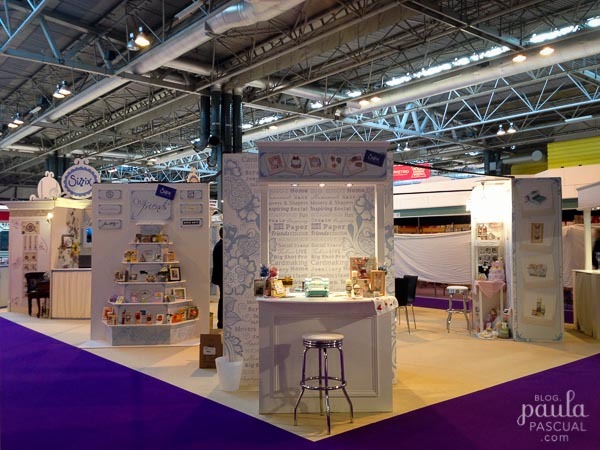 Seeing Kirsty Wiseman demonstrating at Fantastic Ribbons and the always lovely Rachel Greig from the Darkroom Door was at the Personal Impressions - the European distributor of her products - stand demonstrating her great products. 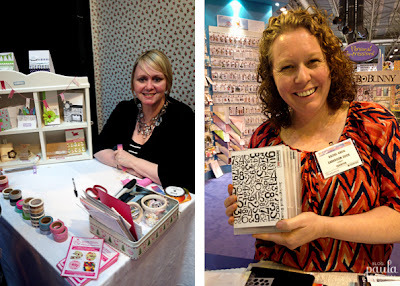 There should be another photo here, of two of my most admired UK crafters, which are Julie Hickey and Lin Brown. But I was forbidden to post it! 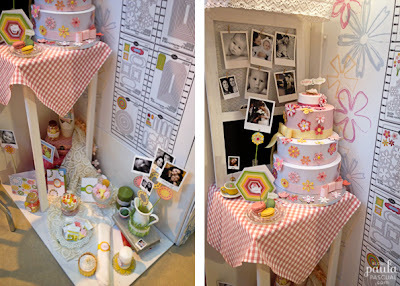 But, I had to steal this photo from Lindsay Mason's blog. 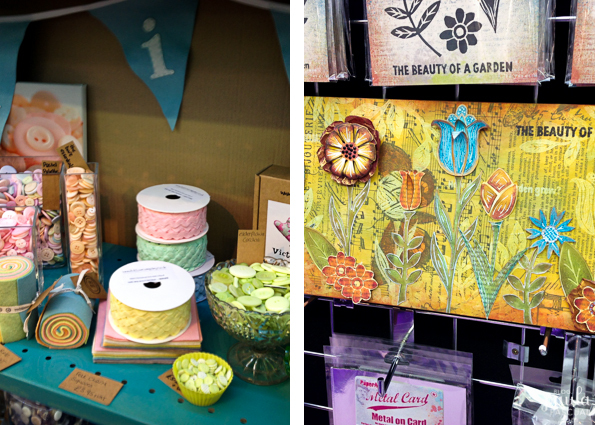 She is one of my very dear friends in the craft industry. Indeed, I love Lindsay, she is such a talented artist, demonstrator, designer... and yet humble and lovely. Well, that is it for a Stitches recap. After that I went to Spain for ten days. I shall post more about that soon!